Greig and Caroline Carroll began cruising in 2014 on SV Lequesteau, a Niagara 42 hailing from Halifax, Nova Scotia, Canada. They left Toronto, transiting the Erie barge canal and then the ICW to Florida before jumping to the Bahamas. 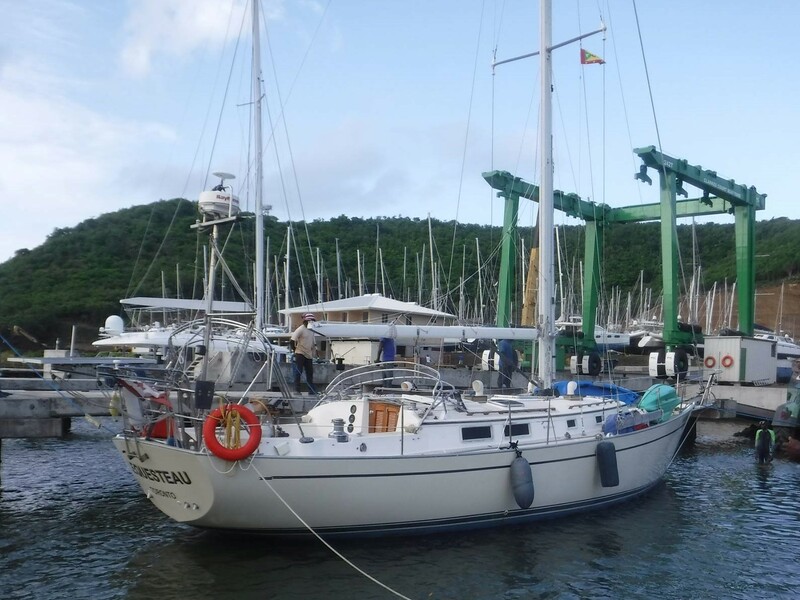 They have since spent three years in the Eastern Caribbean and ended last year sailing from Martinique to Bonaire. I'm not sure I'd say have any “favourite” pieces of gear but I do have some that I use a lot. I think the first one would be anchor windlass. It is so much easier to bring the anchor home under power than it is by hand. I think the second is the dinghy and outboard motor. We have a 2006 mercury 9.9 that hasn't given us any trouble outside of normal maintenance. While underway I find that the auto helm is a God send. Without it, there would be many hours of hand steering which would take away from the fun. I think the one thing that I'd like to have that we don't is either a wind generator or more solar power to charge the batteries. We have 420 amp hours of batteries and only 150 watts of solar. This doesn't fully charge the batteries. With a wind generator, I wouldn't have to worry about the solar most days as a pretty good breeze glows. A water maker is pretty high on the list as well but so far we've been able to get water just about everywhere. So far my favourite place has been Bonaire. It has the crystal clear water of the Bahamas with the ease and convenience of being able to get pretty much anything we need provision wise and at a decent price. The diving on Bonaire is outstanding. Over 100 sites and all within easy access. The trip from Georgetown, Bahamas to St Marteen would be the roughest part of the trip. All those miles straight into the wind and seas for days. Or having to get up and underway at 0400 to get the least amount of wind and then have to be tucked in by 0900. I had heard but did it believe it was as bad as they said. It truly was the “Thorny Path”. The Caribbean is all gentle breezes and calm seas. When we left I figured we'd be sailing south with a nice easterly breeze cooling us under full sail and gently rolling seas. Well, most of our time in the Caribbean has been close hauled and pounding into choppy seas. Not until we left Martinique to sail to Colombia did we actually get to sail down wind. The seas were still up a bit. Right now in Santa Marta Colombia the wind has been howling at for over a week to the point where we are heeling over in the marina. We sailed off Nova Scotia for many years as well as both my wife and I have each have over thirty years in the navy. Customs!! I'm not sure how an organization as regulated as customs can have those regulations interpreted so many different ways. So far the US has been the worst. When we cleared into the US at Oswego, NY we were with three other boats. When we called customs they asked if we had a cruising permit. We said no some we were told to call the main office in Syracuse the next morning which we did. A customs agent came down and inspected our meat and fruits and vegetables. He confiscated our lines and oranges saying that we couldn't keep them as they may contaminate the Florida citrus crop. I get that but the label on the oranges said product of Florida! Ok whatever, we got the stamp and we're told as Canadians we had six months. Off we went. When we got to Charleston, SC two customs agents came down the dock and asked if we'd cleared in. I told them we did in NY about a month before. They asked if they could come on board so of course we let them. They went through our paperwork then started to fill out a form and when they gave it to us they said that it was a warning for not checking in next time would be a five thousand dollar fine and the third time was ten thousand and the third time was one hundred thousand and up to six months in jail and they would take the boat! We were a bit dumbfounded. When I asked what he meant he told me that whenever we moved the boat we had to call the local customs office and report the move. I told him we didn't have a phone was there a VHF channel I could call them on. He said no I'd just have to figure it out. So we got a phone and called in every night. Several times I was asked why I was doing it so I explained what we were told. I got several different responses from you don't have to do that, to we only needed to call in when we entered a new district. The other boats we entered Oswego with all got different responses to their check-in. One had a cruising permit faxed to them, one had it delivered by a kid in a rubber dingy because the customs agent was on the wrong side of the Harbour. One was never even asked if the had a cruising permit. None of us were told about calling in. If I'd driven my car across the border I could have gone anywhere in the US for 6 months and never had to check in anywhere. That's my rant! I'm not sure I can say we've been disappointed with anywhere we've been but there are some places we've been told were the best places and people would go back and never leave if they could. The Grenadines were one. Friends told us that they were next to Gods country. They were ok but nothing I'd have to go back and see. I think Curaçao would be another. I was expecting so much after hearing about the ABCs. Maybe it was after Bonaire nothing was going to compare. Other than that there's nowhere that we were really disappointed over.